Many tend to look at short stay city breaks in isolation and do not realise that for a little extra cost and a few more days they can enrich their experience of the country they are visiting. Athens is a perfect example, in that the city is in close proximity, not only to fabulous ancient sites but also to beach resorts - in many ways the perfect combination. This two centre itinerary does exactly as described above - linking Athens with Tolon, a resort we have featured since 1975, which not only offers ‘beach’ but is in close proximity to some fabulous archaeological sites. We can also arrange two centre itineraries from Athens to Nafplion, Agistri and Poros. Please contact us for details. On arrival in Athens, you will be transferred (36 min) to the 3 star Philippos Hotel. The Phillipos is very well located being 250 metres from the award winning Acropolis Museum, 450 metres from the Acropolis pedestrian areas and a 10 minute walk to the restaurants, tavernas and shops of Plaka. You could not be in a more central location. Depending on what time you arrive, either stroll around the area to familiarise yourselves with the locality or head to Plaka for your first taste of Greek cuisine. One of the best ways of getting your bearings in any city is to take an open-top bus tour. These are generally hop on hop off and once you have completed one circuit you will have a very good idea of what is where in the city. Lunch should be in the excellent restaurant of the Acropolis Museum. From the terrace you have one of the most dramatic views of the Parthenon high above. The restaurant serves regional dishes. A visit to this superb, modern museum is a must. Then head to Syntagma ( Constitution ) Square and relax in one of the many cafes to simply people watch. Finish the day with another stroll around Plaka and dinner in a restaurant or taverna. 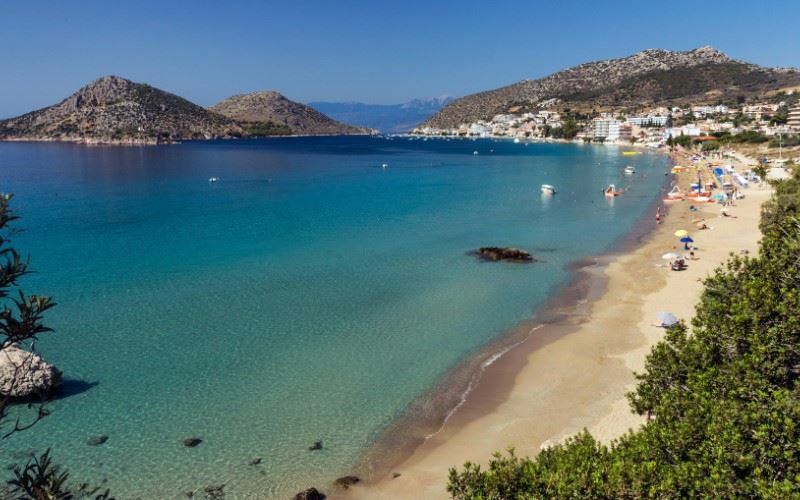 Well, depending on the weather you could take a day cruise around some of the nearby islands or an excursion to Delphi. Our local agent can help you book these. However, there is still much to see in Athens. The Archaeological Museum and the Benaki Museum are two of the most famous museums in the city. Of course there is the Agora (market), which you would have driven by on your open top bus tour so you can head for that area which is round the back of the Acropolis. It’s a fascinating market with much to see and buy (if you have room in your luggage). For dinner, why not head to the restaurant on Mount Lycabettus, 300 metres above sea level for a spectacular view over the city at night. Ask for your car to be delivered to the hotel as early as possible so that you can make the most of a very interesting drive (there are tolls) to Tolon (2 hours). Once you have negotiated leaving Athens you will find that the E65 motorway makes the drive to Tolon both easy and interesting. Before the motorway, it would take a good 3 hours to drive to Tolon. Your journey takes you past the Corinth Canal so make sure you stop there to view it and to have a coffee and snack in one of the many cafes. The canal is a wonder of engineering but, nowadays, the modern cruise ships cannot use it because they are simply too large. Make full use of the fact that you are driving past Ancient Corinth. The site is open from 08.00 to 20.00 in the summer but only till 15.00 in the winter. Once you arrive in Tolon take a swim. The beach is long and sandy and the 3 star Minoa Hotel - another long term Sunvil favourite - where you are staying, is right on the seafront at the narrow end of the beach. You will find tavernas and restaurants all along the beach - our favourite is the restaurant at the nearby Romvi Taverna where your table will be inches from the lapping waves. This region is where history began and where to visit is the question. You have a choice of the theatre and museum at Epidaurus, Mycenae, Tyrins, Nemea, Kefalaria (perhaps the first pyramids before those in Egypt) and Argos, to mention the well-known sites. Realistically, you will have time to visit two sites and we recommend the theatre at Epidaurus and Mycenae. You should make an early start and get to Epidaurus (19 miles) before the coaches arrive. In the early morning or last thing at night and without the crowds, the theatre, one of the most exquisite in Greece, is magical. A 50 minute drive will bring you to Mycenae, a UNESCO World Heritage site. At its peak between 1550 and 1450 BC Mycenae was the main centre of Aegean civilisation and had a population of 30,000. The Lyon Gate, the entrance to the citadel, is the sole surviving monumental piece of Mycenaean sculpture. Return to Tolon for an early evening swim (the best part of the day for a swim) and dinner on the beach. Time to relax on the beach, swim and tan. If you still feel like a little exploring then it is a 20 minute walk along the beach to the renovated site of Ancient Assini for wild flowers and wonderful views along the beach to Tolon. Dinner in Tolon. You would have discovered your favourite eating place by now! From Tolon it is a 2-hour easy drive (most of it motorway) to Athens airport for your flight home. Allow at least 4 hours to get there and don't forget the tolls. Right on the sea, with a small beach to one side and close to Tolon's fishing harbour, is Minoa Hotel. Long established, it has built up an excellent reputation and the family who run it ensure a friendly atmosphere. Right on the sea, with a small beach to one side and close to Tolon’s fishing harbour, is Minoa Hotel. Long established, it has built up an excellent reputation and the family who run it ensure a friendly atmosphere. The Minoa offers not only an excellent location, perhaps the best in the village, but a standard of comfort and facilities above its official category and in our opinion is one of the best run and most comfortable hotels in Tolon. Due to its location, ramp access for wheelchair users and lift we consider the Minoa to be a good choice for those of limited mobility. Guests may also use the swimming pool of its sister hotel, the King Minos a 5 minute (but steep) walk away.